We absolutely adore everything about this wedding! 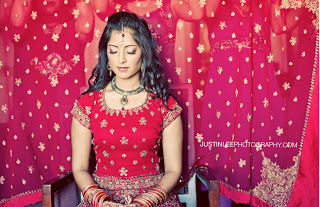 The photography…the incredible food (inspired by authentic Indian dishes)….the florals….and the beautiful lighting. The wedding took place in January at the Scripps Forum, and it was one of those beautiful winter days we’ve been blessed with lately. While the ceremony was traditional, the remainder of the party was anything but. Pinky and Martin had a packed dance floor all night, and it was a blast to see so many ladies in their saris rockin’ it on the dance floor! One of Melissa’s favorite details of the day was the PINKy MARTINi, which was a hit all around. Pinky and Martin, thank you for allowing us to help plan your wedding celebration. It was truly unique and amazing! So beautiful they are, the setting is, the photography by Justin, the florals, the work you do!